Most nights I walk or jog 4-6 miles and my route takes me through the “Academical Village” at UVA. It is a beautiful and yet very conflicted historical space. 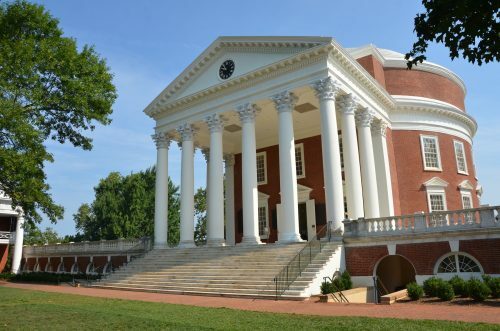 Built in part by slaves, the design – and especially the neoclassical Rotunda – really can open the mind, just as Jefferson intended. On Friday night, August 11th, as I walked past, I saw the white supremacists march up the Lawn to the Rotunda with their torches. Initially I was not quite sure what was going on but within seconds I felt something akin to an out-of-body experience. My initial thought was they were going to disperse across the lawn and burn it all to the ground. Seeing the Village filled with violent torch wielding bigots, marching in a long column, I thought suddenly of Leni Riefenstahl’s 1935 propaganda masterpiece Triumph of the Will. Adolf Hitler and Albert Speer saw architecture as a cudgel, creating designed spaces to intimidate, an approach completely antithetical to Jefferson’s design for a university. The fact that those marching felt secure enough in their actions that a hood need not mask their white faces reminded me even more of Germany in the 1930s. Future walks to the Rotunda and through Grounds will call up painful memories for me and for others, the quiet echo of anti-Semitic and racist chanting coupled with the haunting vision of burning torches. On Saturday I woke up unexpectedly late, feeling very ill. I did not go downtown until almost noon. For some reason I had assumed that the National Guard would be out in force all across Charlottesville to clamp down on movement and the possibility of more violence. This was not the case. I walked around town and then I heard about the car attack as I was heading home. It was clear that the streets were becoming even more chaotic and less safe, if that was possible. Upon arriving back home, I turned on CNN for the first time in years and watched images of my town in turmoil, from cameras filming two miles away. I am not sure what I did for the rest of the day. On Sunday morning, I went to church services and afterwards went down to 4th and Water Street to pay my respects to the memory of Heather Heyer and to those who had been injured. A single line of bouquets lined the bottom of 4th, a spontaneous memorial next to a heart made of flowers. A vigil and memorial service were scheduled for that night at 6PM. Many people gathered that night to reclaim the spaces that white supremacists had usurped, carrying candles and saying prayers. 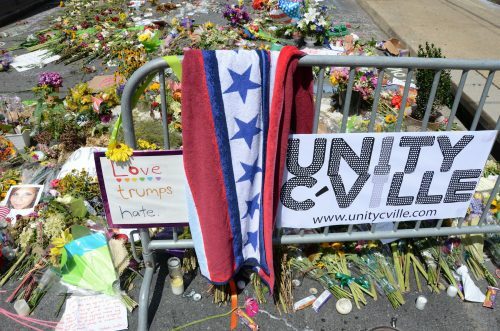 Now that the blood has quite literally been washed from the streets, Charlottesville residents have been asking ourselves: How will we choose to commemorate what happened here two weeks ago? How will we choose to formally remember all the people who stood up against injustice and hatred? All the people who were injured all across downtown on August 12? And, those who were injured and killed in the car attack? One way to remember is through our own actions to create a more equitable world. At Heyer’s memorial service on Wednesday her family and friends described a person who quite simply wanted to make the world a better place, and spent most of her time working to make that seemingly impossible task a reality. Her mother Susan Bro, brought the crowd to their feet when she took control of her daughter’s legacy and challenged those present to continue to fight the good fight but to do so in the right way. Susan Bro noted that what her daughter wanted each day was a better world, a goal, which she noted, was “achievable.” Making that world a reality begins with each of us, and with the ways we choose to remember what happened here. Some memorial efforts will be material, and integrated into Charlottesville’s already existing public landscapes. These civic spaces are complex and rooted in inequality. As Daniel Bluestone notes in his book Buildings, Landscape, and Memory: Case Studies in Historic Preservation, in the 1920s city officials and boosters changed the civic, commercial, and residential spaces in Charlottesville to accommodate memories of the Lost Cause, while simultaneously uprooting and destroying African-American neighborhoods such as Vinegar Hill. This process accelerated with public housing construction for African Americans in the 1960s. Emancipation Park (which, until quite recently was named Lee Park) is a common public space like those in just about any southern city or small town. Its Confederate Memorial, dedicated May 5, 1909, depicts a lone Confederate infantryman standing at the ready, facing south – unusual in the sense that most of these statues in southern towns faced north, toward the enemy. Two additional statues of Stonewall Jackson in Court Square (October 19, 1921) and Robert E. Lee (May 21, 1924) were dedicated during a Confederate reunion, in a time when race, memory, and the Civil War became central to regional identity. The choice made to fund these statutes and parks for Confederate generals was not a “community” decision, as African-American residents in Charlottesville were excluded from any role in the process. The land and much of the money for the Jackson and Lee statues was donated by local philanthropist Paul McIntire, who was also a major donor to UVA. In recent days, the city has taken a dramatic step to deal with the Confederate memorials that remain in the town’s public spaces. 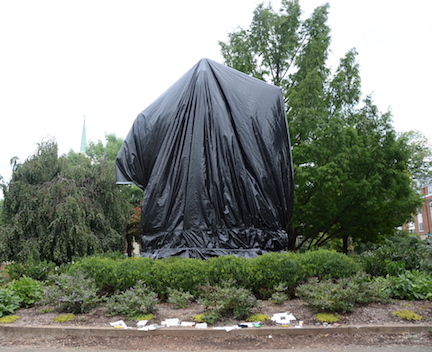 On Wednesday the 23rd, the Lee and Jackson statues were covered by tarps, to honor the recently fallen. 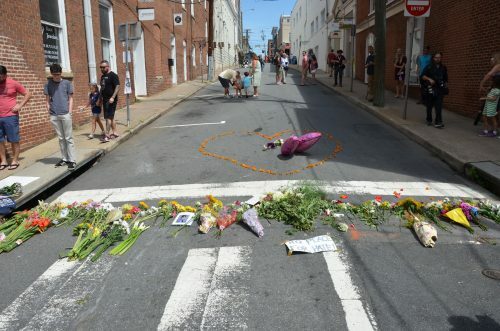 In addition, there are petitions circulating on Change.Org, calling for other forms of memorialization: a statue of Heather Heyer in place of Lee and also the permanent closure of 4th Street, making that street into a memorial. There would be some traffic complications as a result for the latter, but those would be minor. I believe it is the right thing to do. The construction of a memorial fountain on 4th would also bring a sense of life, contemplation, and tranquility to those who pass by and want to stop, reflect, and remember. Tonight, members of the Justice Department will take part in a Community Recovery meeting to discuss all of these options, and a path forward. In the meantime, the spontaneous memorial on 4th street continues to grow. Since Sunday August 14th, I have spent any number of hours down at the memorial talking to people and, more importantly, listening to people. They bring flowers and gifts, they pray, they cry, they speak quietly, and they use the chalk that is present to write inspirational messages on the walls of surrounding buildings, and on the street. Stuffed animals, religious candles, American flags, signed cards, and small posters cover the road along with dozens of flower arrangements. The parents who are there with their families struggle and search for a way to explain what it all means to their children. Mostly the people who wander through just seem to cling to each other, in the hope, I suppose, of beginning to make sense of what happened that terrible weekend. In many ways Charlottesville has come full circle. What began as a violent incursion and protest by outsiders in our city’s public landscapes has now morphed into the dedication of other spaces to honor others who have fallen. For those of us who live in Charlottesville, the tragic and violent events of the weekend of August 12th have been heartbreaking, confusing, and exasperating. The violence, acts of terror, and murder carried out by white supremacists, Ku Klux Klan members, and Neo-Nazis aligned with the Alt-Right were calamitous. 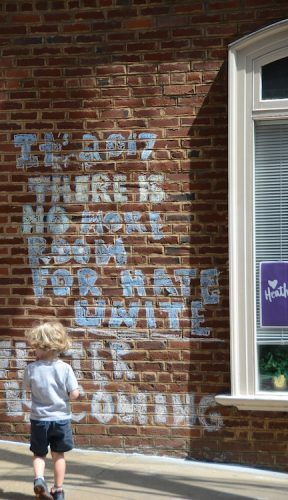 Charlottesville residents are beginning to rebuild our community, and grappling with how to remember the “rally” and those who lost their lives and were injured. In the 1920s, white residents sought to build a foundation for the future by honoring the wrong side of history. I very much hope we can make better decisions a century later. Gerard J. Fitzgerald is an environmental historian who lives in Charlottesville, Virginia and studies the impact of war and industrialization on 19th and 20th century America. He is a visiting scholar in the Department of History and Art History at George Mason University. He can be reached at gfitzge2@gmu.edu and can be followed on Twitter @gfitzgerald111.